I know, I know. How can you build a deck of mahogany? It’s so expensive. Your grandmother had that gorgeous mahogany dining table, and it cost $300 over 60 years ago. But that table was made of furniture grade mahogany (Swietenia mahogany or perhaps swietenia macrophylla) — dark, fine-grained hardwood from Honduras. There are many, many species of wood called “mahogany.” The mahogany used for deck flooring is not Honduran mahogany. It is normally Cambara from Brazil, or Meranti from Indonesia. And the cost? Decking mahogany costs more than Pressure Treated pine (“PT”) and more than knotty inland cedar – but less than D cedar, A cedar, redwood, ipe, and garapa. Indeed, it costs less than any other outdoor wood and less than any artificial composite or plastic decking. 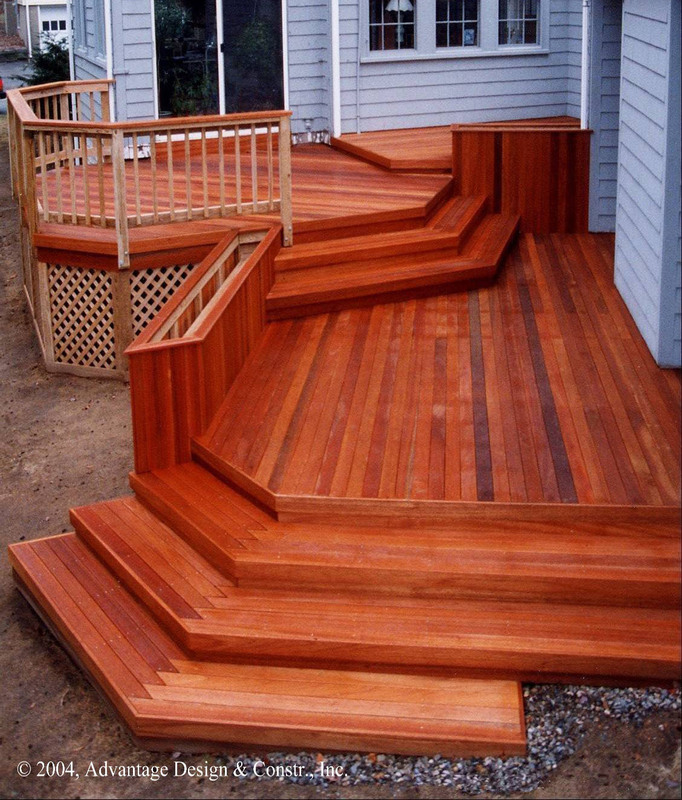 Whatever you choose for the floor and rails of your deck, the frame is always pressure treated pine. 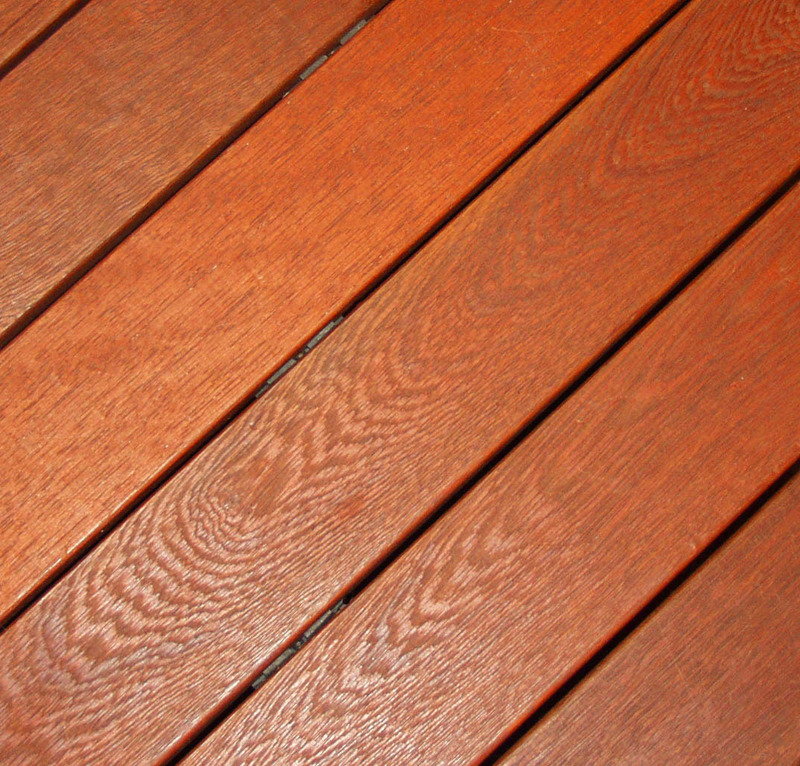 People like mahogany decking for its hardness, rich color, tight grain, and knot-free appearance. It naturally resists rot and does not splinter, especially if treated with a good penetrating oil. It is best fastened with high quality stainless steel, since the resins that protect mahogany from rot can interact with lower grade stainless steel to create blackish stains. Decking mahogany is a true exterior hardwood that stands up well to foot traffic and will endure outside for many, many years. Of the two types of decking mahogany, Cambara is more consistent in color and lacks the dark and light boards common with Meranti mahogany. Other than that, the two are very similar — in features and in price. If you have concerns about cutting rainforest trees, you can pay a premium for Cambara or Meranti that is certified by the international FSC (Forest Stewardship Council) to be responsibly harvested. This is my third blog about decking materials. Next, I’ll address that American classic — cedar. We at Advantage Design & Construction offer professional design and build services for clients west and north of Boston. Over the past 23 years we have designed and built over 800 projects, including over 200 mahogany decks. We have enhanced the depth of our expertise by limiting our work to decks, porches, and sunrooms. To view some of these projects, visit our website. To learn how we treat our clients, check our ratings on Angie’s List or read about us in an article in Remodeling magazine. For a free design consultation and a relaxed and rewarding experience, contact us via e-mail, subboston@archadeck.net or by phone, 781-273-3500. NextWhich Cedar for your new Deck? Wow! Mahogany looks beautiful, I did not know it could be used for decks. How do you maintain a mahogany deck? Does it require any kind of special treatment or do you just apply an oil treatment? Is power washing bad for the deck???? Thanks for your question! A quick overview for maintaining a mahogany deck: (1) Treat it yearly if the deck gets direct sun all day, or whenever the sun bleaches it too an unacceptable grey color. (2) Use a penetrating oil formulated for such hardwood; there are five commonly available. Other treatments and oils do not penetrate the mahogany’s tight grain, sit on the surface, and can flake off. (3) Power washing (with a pressure washer) should be used sparingly (every few years) and carefully, since the spray can damage mahogany (or any wood) if not done properly. Your question warrants a more detailed answer, and I’ll do so in a future blog. Very interesting wood information. Good to know you can even use sustainable wood.